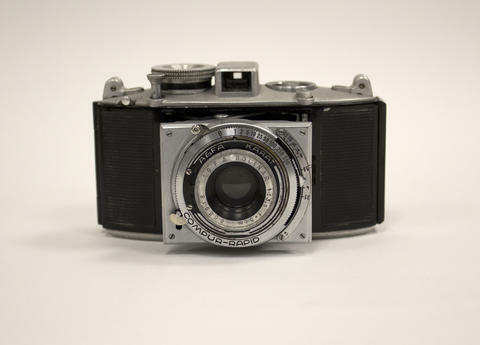 Item consists of an early model of the Agfa Karat 36 35mm camera, also known as the Karomat 36. It has a Compur-Rapid 1-500 shutter, a Schneider-Kreuznach Xenon 1:2/50mm lens, and an optical viewfinder with superimposed rangefinder. It was the first of the Agfa series of Karat cameras to move from Rapid cassettes to 35mm cartridge film. It strongly resembles the Karat 12, but features an accessory shoe, a rotating time exposure lock, and a film rewind knob instead of a depth of field dial. Instructions have been taped onto the back of the camera.